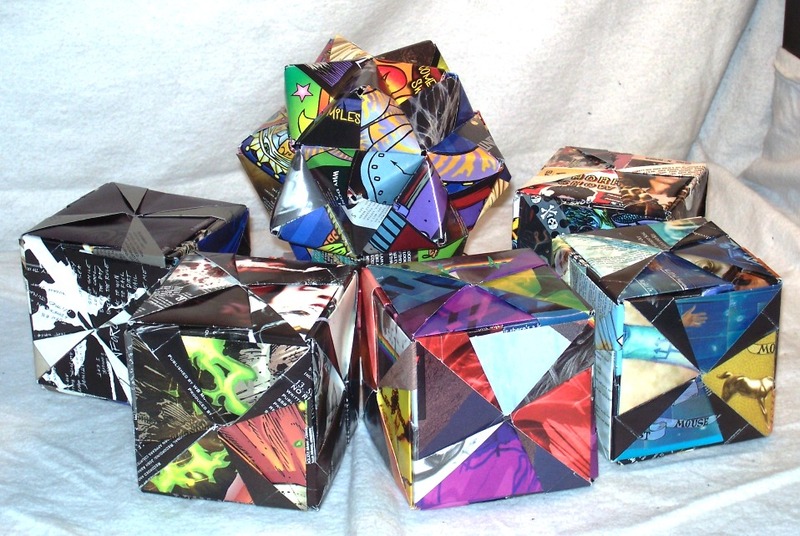 Throughout the weeks, I’ve been continuing my Rock N’ Roll-igami series of modular art, with gorgeous results. Thanks to booklet donations, I’ve been able to complete several dynamic classic rock pieces, featuring some of the most iconic performers of the late 20th century. Amigami is always looking for more CD booklet donations! I will make a custom piece for each person who donates, and am willing to negotiate payment for larger contributions. Please contact me via the comments form or the ‘Contact’ tab at the top if you would like to contribute to the Roll N’ Roll-igami series. It seems that as I’m sprting through the collection, many hard rock and heavy metal albums have longer than average CD booklets, so my work has gravitated in that direction due to availability of supplies. 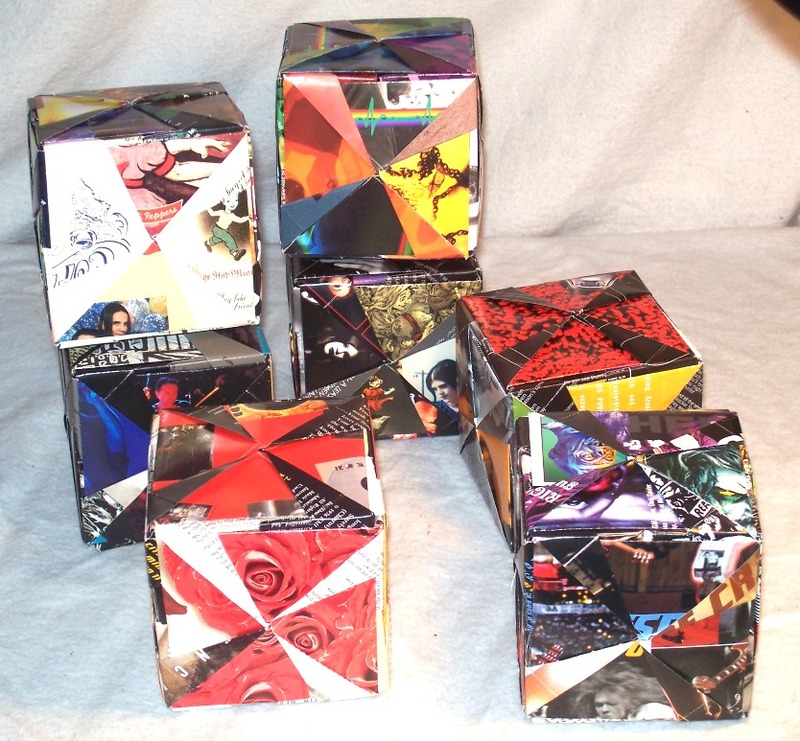 The contrast and images on these cubes really make them stand out, and they (obviously) cast a whole different feel than some of the more colorful examples (like the Pink Floyd or Offspring pieces). 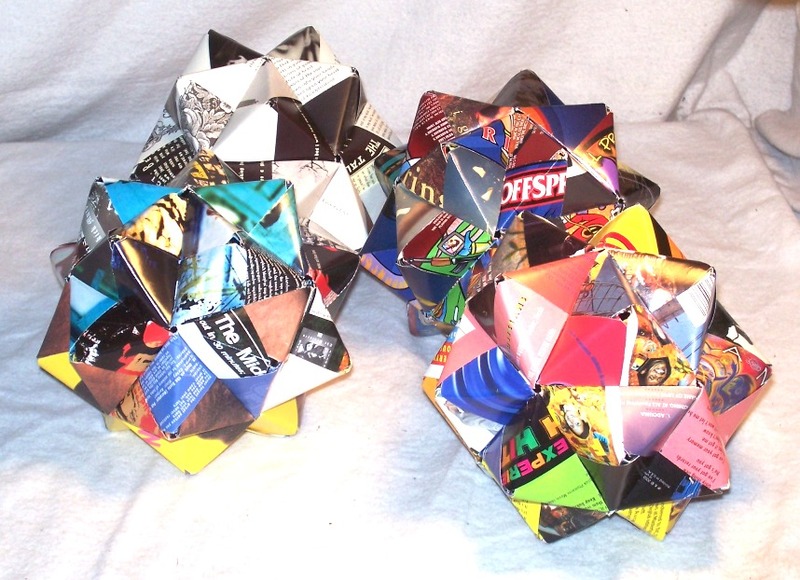 Luckily, I previously owned plus inherited several book lets from Offspring CDs, enough to make this spectacular icosahedron! Folded from 30 pieces, using the traditional Sonobe design, this piece spans the history of the Offspring’s major releases, from Ignition to Splinter. 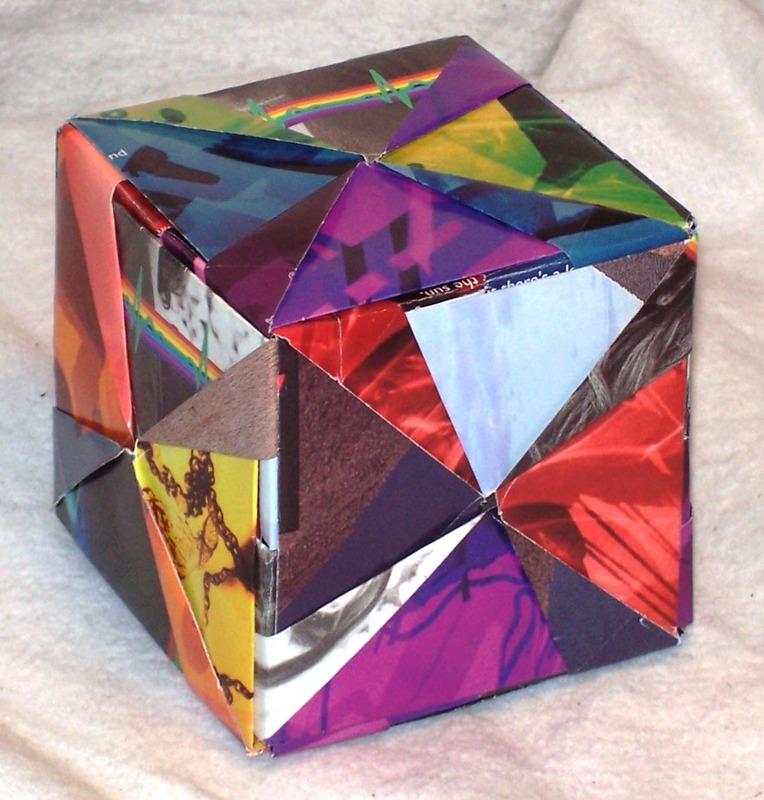 The vivid graphics common to Offspring albums are ideal for modular origami, and the rainbow of images has really made this one of my favorite pieces. In contrast to the heavy metal cubes, I made this for Ramon, since he so graciously donated so much material to me! 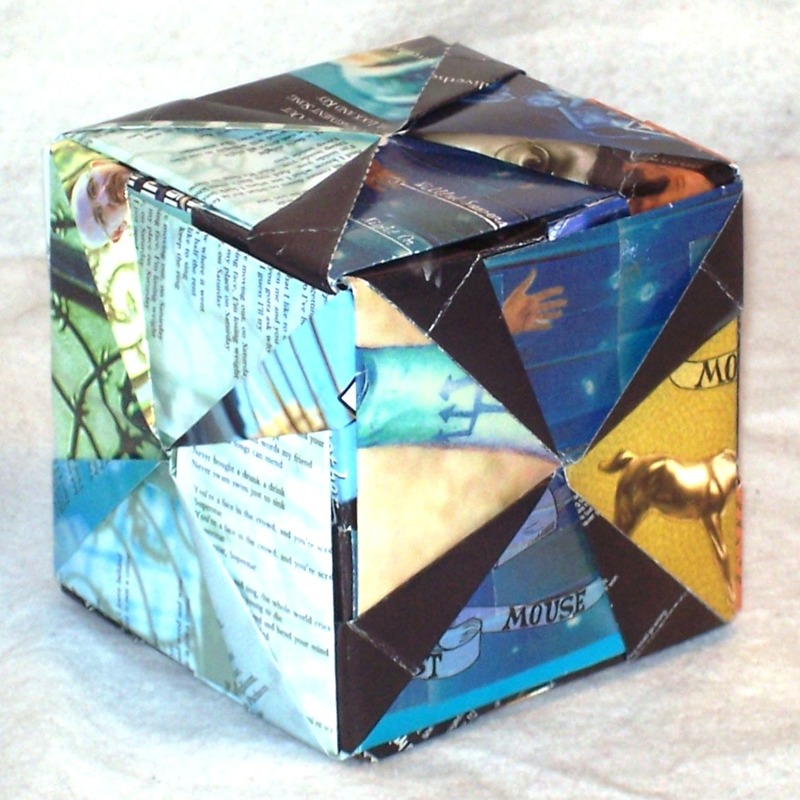 Similar to the Offspring sphere, this cube features fthe booklets of four Clarks CDs, along with a scattering of images from Sugar Ray and Modest Mouse. This piece was made by custom request, and if you have the books, I can make the art! Or, if your favorite band is already represented here, be sure to pick it up in my Etsy shop before someone else does!